Over the past two years, the Center for Community Change, along with Lake Research Partners and ASO Communications, have been working toward one audacious goal: to revolutionize the way we talk about poverty. To get there, we needed a revolutionary way of thinking, which is why we decided to approach our problem as though we knew nothing. We spoke with over 6,000 people from diverse backgrounds to see what kind of language resonated with them and inspired them to act. Most importantly, rather than simply testing our own messages, we let people speak for themselves and we listened. With the specific goal in mind of finding ways to talk about poverty that resonated with our base of supporters and drew persuadable audiences in the middle to our side while actually alienating our opposition, we walked away with a wealth of revolutionary knowledge about how to message this issue. Here are some key takeaways. 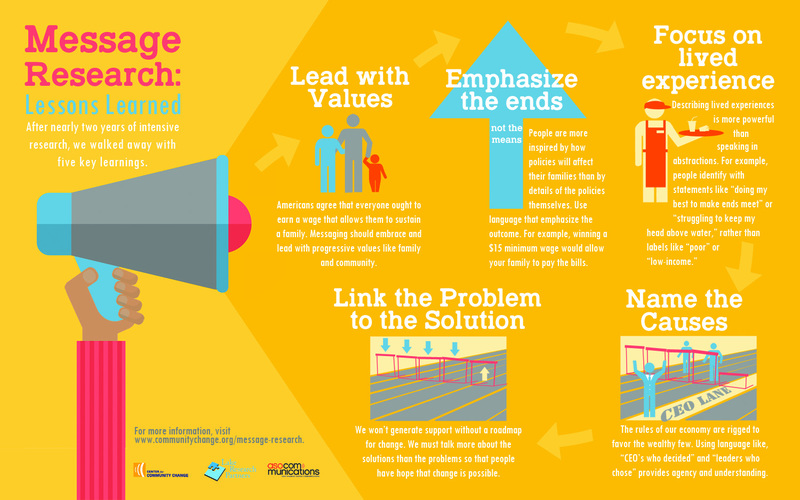 All of the materials from our two-year message research project are available at communitychange.org/message-research.